Cozy up with this restaurant favorite. 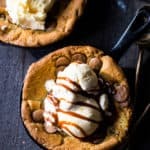 There's nothing quite like and warm and gooey bite of cookie topped with melting ice cream! In a large bowl, beat together butter and sugars until light and fluffy, about 5 minutes. Stir in the flour, baking soda, baking powder and salt. Add the chocolate chips; stir to combine. Press the dough mixture into the bottom of one 8-inch or four 3.5-inch cast iron pans. Remove from the oven and top with ice cream and caramel or chocolate drizzle and serve!